Significant increase in battery life in all of our Doppler units – up to 400% for certain models. Each additional probe is $160. 3 MHz obstetrical probe optimized for early fetal heartbeat detection and best for use during entire pregnancy. 4 MHz for easy location of blood vessels. Broad wide angle and internally tilted crystals are optimized for finding vessels and ABI exam. SD5 5 MHz for identification of deeper vessels. Narrow beam and shape used for ABI exam and locating deeper vessels. SD8 8 MHz vascular probe. Narrow beam and shape for optimum sensitivity and ease of use. SDW 2 MHz Waterproof probe for obstetrical use. 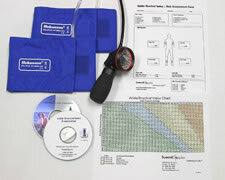 ABI Kit Summit Doppler offers a complete kit for the Ankle Brachial Examination (ABI). Learn more about the ABI Exam and instruction on how to perform the test. 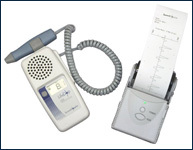 Kit includes Aneroid, Cuffs, ABI Forms, Chart, and Video.